Incorporate Reading & Writing into the Math Classroom with this article and accompanying worksheet! 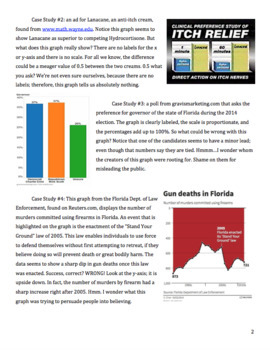 The 4 page article is entitled - "How the Media Uses Statistics to Mislead Audiences: Real- life examples of really bad graphs". 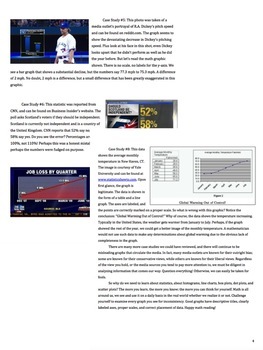 The worksheet helps students summarize the case studies and the article as a whole. This resource can be used in so many ways, some ideas are: station activity, independent reading assignment, small group activity, homework assignment, or whole class discussion. 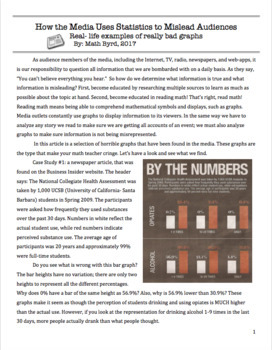 Students will read the math article filled with erroneous statistical displays, including: bar graphs, line graphs, scatter plots. Students will analyze the characteristics of each graphic including axes, scales, descriptive titles, and precision. CCSS.HSS.ID.A.1 Represent data with plots on the real number line (dot plots, histograms, and box plots). CCSS.HSS.ID.B.6 Represent data on two quantitative variables on a scatter plot, and describe how the variables are related. CCSS.HSS.ID.B.6c Using given or collected bivariate data, fit a linear function for a scatter plot that suggests a linear association. CCSS.HSS.ID.C.7 Interpret the slope (rate of change) and the intercept (constant term) of a linear model in the context of the data. *Purchase of this product provides one (1) purchaser the rights for solely personal classroom use. 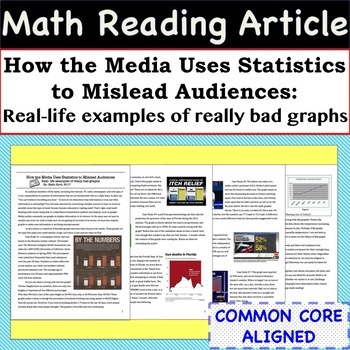 Posting any part of this publication on the Internet in any form, including classroom websites, is strictly prohibited and in violation of the Digital Millennium Copyright Act. To share this resource with colleagues, please purchase additional licenses. Inquire to mathbyrd@gmail.com for discounted multiple license purchases.